Camfrog Video Chat for iPhone & iPad! Camfrog Video Chat for iPad and iPhone are now both available for purchase in iTunes. Both apps allow you to join Camfrog Video Chat rooms for audio chat, or video chat one-on-one privately with your friends. Obviously the iPad doesn’t yet have a webcam, but you can still view your iPhone and Camfrog desktop application friends one-on-one. If the apps are popular and get good reviews we’ll try to add room video chat also. Room video chat uses a lot of CPU so we are still working to try to make it possible on a mobile device. 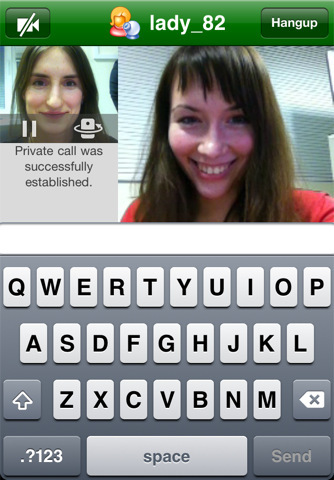 ← Camfrog Voice Chat 2.0 for iPhone now available! Pif, Android is our main mobile priority in 2011. I very need , we must best developer system Linux , Camfrog Video Chat For Linux. Thanks!!! great admin i love to hear about this.. android is very nice stable and a iphone killer smile 🙂 i have an HTC Desire i would like to be a beta tester for android version..
naga ? do buy the codes before dezember ? 1 code one bot ! Tucholsky, I bought them before Dec. 10. I knew about the “New Policy on Pro” and the Bot 5.0, anyway. Thanks. But, I think this case is so rampant. Not only me, but also friends of mine got this prob. Admin, everything is running well now. My bots are all back to normal. They are not invalid as I worried about. Thanks a lot. Anxiously waiting for chat room video support for the iPhone! Please add video chat in room support! I haven’t been able to use cf on on the computer and even If I can only see one cam at a time it would be a great supplement. PLEASE! please can you make it working with iOS 4.1 on Iphone 4G ? User profile don’t work with new site pls check!!!! is camfrog for android 2.2 OS phones already in the market??? plz tell me… tnx!! !